Japanese pygmy angelfish larvae (Centropyge interrupta) were raised from captive-spawned eggs at 77-79F on wild copepods and artemia. The larval duration was 58 days. First record of Japanese pygmy angelfish culture. The Japanese pygmy angelfish is a stunning fish and rare in the trade. It commonly occurs in the northwestern Pacific Ocean along Japan’s southern coast, particularly at the Izu Peninsula, but it can be found as far south as the northern most Hawaiian Islands. It thrives on a quality gel diet, small pellets, high-grade flakes and frozen adult brine shrimp. It reaches up to 6 inches in length. Left: A pair of Japanese Pygmy Angelfish (male on right). 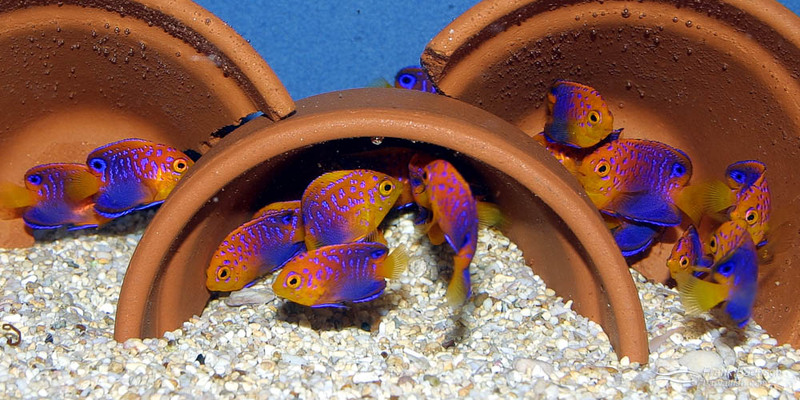 Right: 65-day-old Japanese Pygmy Angelfish juveniles. My wild adult broodstock required cooler water temperatures between 74 to 80º F but my first generation juveniles adapted and do well in water temperatures up to 82º F.